Hi ladies, remember those projects I mentioned I’ve been working on in the background? Well, I’m excited to unveil one of them today! A couple of months ago I posted this pretty origami hearts project, and you LOVED it! So, I’ve teamed up with the creative and talented lady behind it, Fanni from Fubumedia, to create a new brand new feature – DIY Thursdays! DIY weddings are so hot right now, a great way to inject some personality and meaningful touches to your day, so every other Thursday we will be sharing a step-by-step project for you to include in your big day! 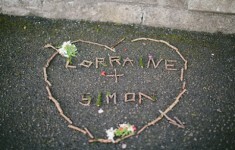 As much as I love DIY brides, there’s one piece of advice I have to share with you: don’t let it take over your life! (That goes for all aspects of your wedding planning actually!) 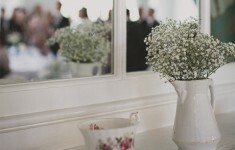 Yes, I know you want everything to be perfect (trust me, so do I), but remember to balance life with wedding. So, today we’re sharing this cute little DIY printable project, to encourage you to ditch the planning for one night a week, and spend it with the one you want to spend the rest of your life with! 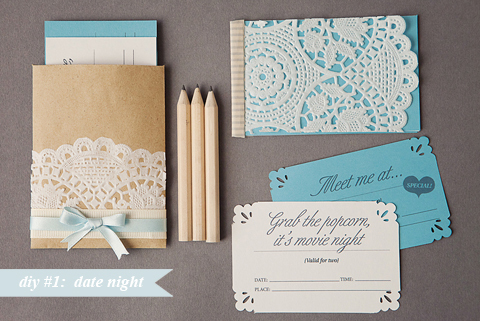 Introducing… Date Night DIY!! Just print out the downloadable template with a choice of date night activities (and some blank ones for your own suggestions), and pop them all in this easy to make booklet and little envelope to keep them all safe! Then, when you feel like a date night is due, write the time and place on the card, and hide it in your fiance’s jacket pocket or lunchbox, or slip it into his wallet or favourite book for him to find later, then enjoy your evening together! 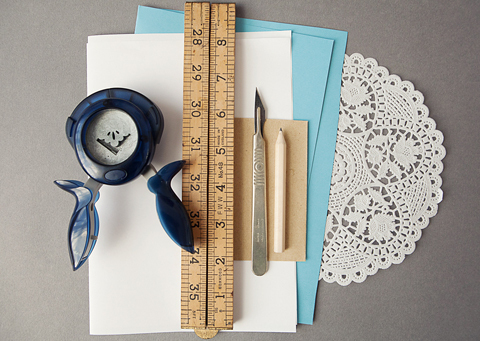 1x 17cm doily which you can cut in half and use for both the booklet and for the mini envelope. 1x paper corner shape cutter of your choice. 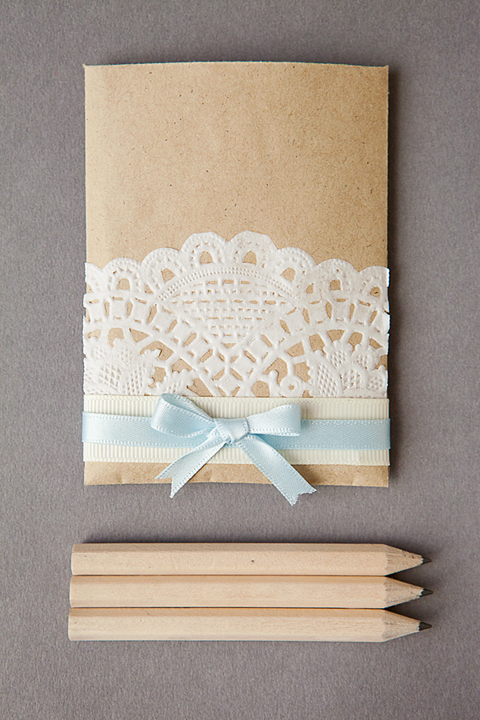 1x Pritstick to glue the doily to the book and the envelope before applying ribbons. 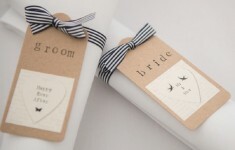 Some decorative/pretty ribbons to decorate the envelope. All these items can be found at your local craft store. First print out the downloadable template on the colour paper of your choice. Line ruler up to match the crop marks on either side of the cards and trim. Once you have all the cards together you can assemble them in alternate colours, one blue one white. If you are making a booklet, gather all the cards together and staple on the left. Then take a decorative tape and cover the staples. You can tear cards out as you go and keep them all in one place. OR alternatively you could leave them as loose cards in the envelope. 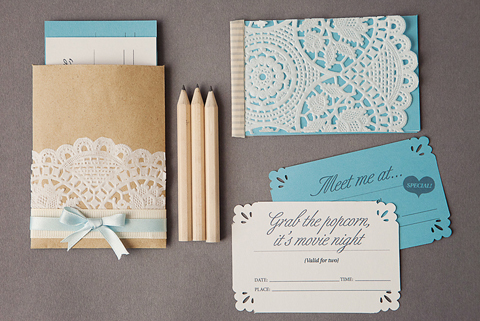 To give each card a little more decorative feel, use the paper shape cutter to punch out each corner of the card. 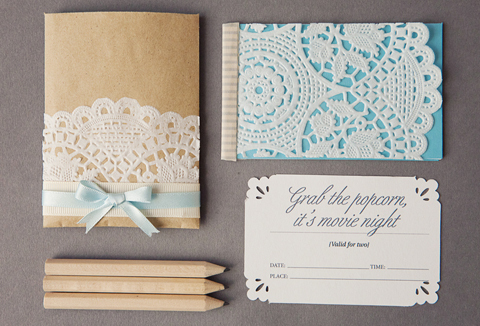 So, there you are, simple and easy Date Night DIY! What are your favourite date night activities? Let us know in the comments box below!